These amazing flowers glow. Each one is unique, handcrafted by artists in the USA. They have a small battery pack attached to the flower that holds one AAA battery inside. The battery is not included. The flower and battery pack each have a locking pin on the back to attach them to your clothes or hair. Light weight, only about two ounces. Roses are about 3 inches across. . Colors available are: Red, Pink, Yellow, and White. 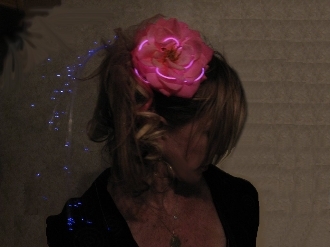 See more of our Glowing items here: http://www.divabelladesigns.com/nightglow.htm?